USD is trying to cover the loss however there are no major economic reports in the world to support or weaken EURUSD. 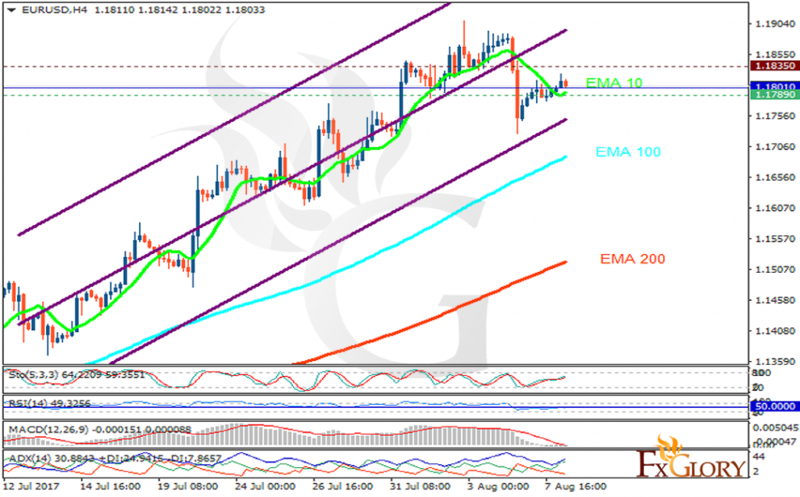 The support rests at 1.17890 with resistance at 1.18350 which the weekly pivot point at 1.18010 is located in between the lines. The EMA of 10 is moving with bullish bias along the ascendant channel and it is above the EMA of 200 and the EMA of 100. The RSI is moving horizontally on the 50 level, the Stochastic is showing upward momentum and the MACD indicator is in neutral territory. The ADX is showing buy signals. Traders can wait for better signals to trade on EURUSD however, the price will be consolidating between the resistance and support area.